Over the past near-decade, including the current period of recovery/expansion, real per capita income growth has been a mere fraction of the long-term norm. This fifth SBE Council “Gap Analysis” looks at the issue of income growth, in particular, real per capita personal disposable income. First, we take a look at growth in nonfarm business sector real compensation per hour, which includes wages, salaries and benefits paid to workers. Average annual growth in real compensation per hour averaged 1.4 percent from 1956 to 2016, and 1.5 percent from 1956 to 2006. However, this past near-decade has experienced a dramatic slowdown. • From 2007 to 2016 – covering the recession and subsequent recovery-expansion period – real compensation per hour growth averaged 0.6 percent. Since the start of the recovery in mid-2009, again, growth has averaged a woeful 0.6 percent. • So, real hour compensation growth during this recovery has registered a mere 43 percent of what the average annual growth rate has been over the past six decades. Second is the key number to consider: per capita real disposable personal income, which is personal income less personal taxes, adjusted for population and inflation. This is the income from which people make purchases, and generate savings and investment. • Consider that growth in per capita real personal disposable income during these recent years of recovery/expansion has registered as a fraction of the long-term average growth rate. The 0.9 percent rate of growth from 2009 to 2015 compared to the 1956-to-2015 average growth rate of 2.09 percent, and 2.3 percent for 1956 to 2006. That is, growth from 2009 to 2015 ran, again, at 43 percent of the long-run rate. 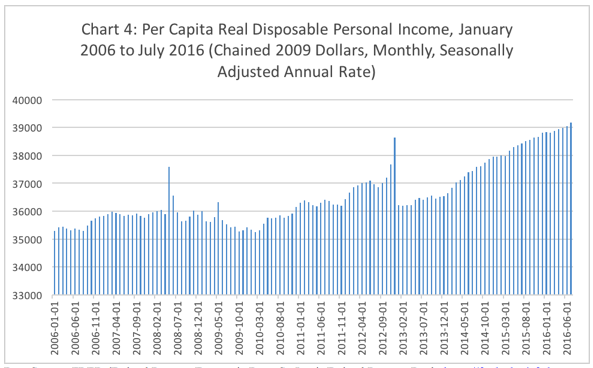 • Finally, if per capita real personal disposable income grew at the average historic rate since 2009, real per capita personal disposable income would have registered $40,322 in 2015 versus the actual amount of $38,368 (both in real 2009 dollars). So, real average disposable personal income would have been $2,000 higher (2009 dollars) on average for individuals, and $8,000 higher for an average family of four. Lost income means lost money to purchase goods and services from small businesses, to save, and to invest, thereby further feeding into slower economic growth and job creation. Over the past decade, the U.S. shifted from a few years of respectable economic growth to a long and deep recession, and then to one of the worst periods of economic recovery and expansion on record. As the nation looks to a new presidential administration and a new Congress taking power in January 2017, SBE Council is publishing a series of analyses that highlight key gaps or shortfalls in our economy. The first analysis focused on the GDP shortfall, the second on a lost decade of private investment, the third on the decline of entrepreneurship and millions of missing businesses, and the fourth on poor U.S. productivity growth. 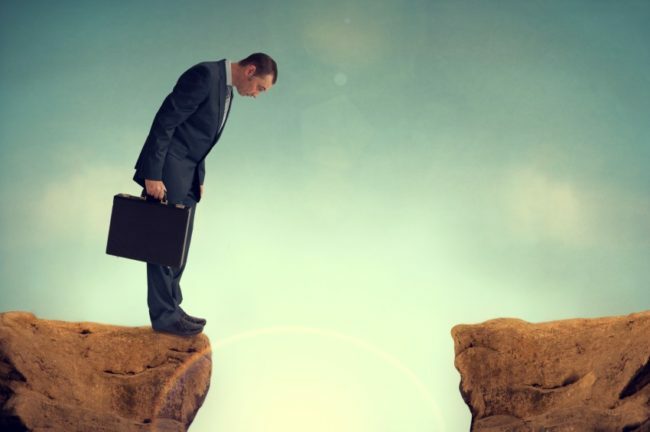 These will be followed by analyses on income (this report), jobs, and trade, with a final report highlighting the basic policy changes needed to close these gaps. This fifth SBE Council “Gap Analysis” looks at the issue of income growth, in particular, per capita real disposable personal income. The reality is that over the past near-decade, including the current period of recovery/expansion, real per capita income growth has been a mere fraction of the long-term norm. First, we take a look at growth in real hourly compensation. Nonfarm business sector real compensation per hour not only includes wages and salaries, but also benefits paid to workers. 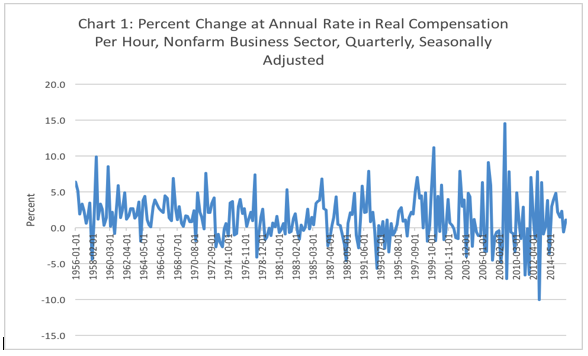 Chart 1 shows the percent change at an annual rate in real compensation per hour (quarterly and seasonally adjusted data) from 1956 to 2016 (including the first and second quarters of 2016). Even on this six-decade chart, one can see the significant drops that have occurred at various points over this last decade. For good measure, growth slowed markedly during the first and second quarters of 2016. The point is made clear in Chart 2. Average annual growth in real compensation per hour averaged 1.4 percent from 1956 to 2016, and 1.5 percent from 1956 to 2006. However, this past near-decade has experienced a dramatic slowdown. From 2007 to 2016 – covering the recession and subsequent recovery-expansion period – real compensation per hour growth averaged 0.6 percent. Since the start of the recovery in mid-2009, again, growth has averaged a woeful 0.6 percent. So, real hour compensation growth during this recovery has registered a mere 43 percent of what the average annual growth rate has been over the past six decades. Given the poor productivity growth we have experienced over the past decade, as noted in the fourth SBE Council Gap analysis looking U.S. productivity growth, no one should be surprised by poor growth in real worker compensation. Going hand-in-hand is poor U.S. economic growth. 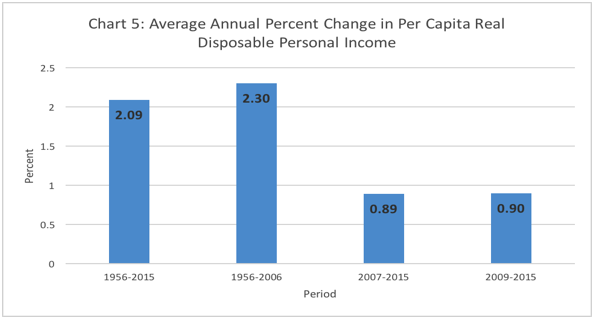 The key number to look at, however, is per capita real disposable personal income, i.e., personal income less personal taxes, adjusted for population and inflation. After all, that’s the income from which people make purchases, and generate saving and investment. 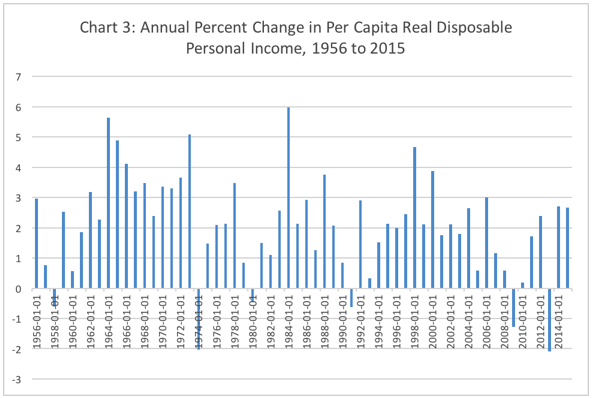 The long run story on per capita real disposable personal income is told in Chart 3. 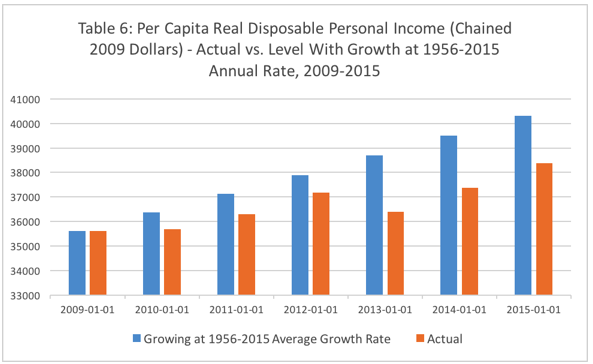 Over the period of 1956 to 2015, real per capita disposable income grew at an annual rate of 2.09 percent. Chart 4 offers per capita real personal disposable income levels over the past decade. Two points are worth highlighting from this chart. First, the recession that began in late 2007 and continued until mid-2009 took a heavy toll on disposable income. Second, subsequent growth in disposable income suffered a major setback with the large federal tax increase that was imposed at the start of 2013. Poor growth in real per capita personal disposable growth over the past near-decade is plainly evident in Chart 5, which shows average annual growth rates over four periods: 1956 to 2015, 1956 to 2006, 2007 to 2015, and 2009 to 2015. Consider that growth in per capita real personal disposable income during these recent years of recovery/expansion has registered as a fraction of the long-term average growth rate. The 0.9 percent rate of growth from 2009 to 2015 compared to the 1956-to-2015 average growth rate of 2.09 percent, and 2.3 percent for 1956 to 2006. That is, growth from 2009 to 2015 ran at 43 percent of the long-run rate. One hopeful point: real growth in 2014 and 2015 (2.71 percent and 2.66 percent, respectively) came in ahead of the long-run average. At the same time, however, through the first seven months of 2016, growth seemed to have slowed. Finally, to drive home what this means for the average person, consider that, as noted in Chart 6, if per capita real personal disposable income grew at the average historic rate (which, by the way, includes periods of recession) since 2009, real per capita personal disposable income would have registered $40,322 in 2015 versus the actual amount of $38,368 (both in real 2009 dollars). So, real average disposable personal income would have been $2,000 higher (2009 dollars) on average for individuals, and $8,000 higher for an average family of four. That lost income means lost money to purchase goods and services from small businesses, to save, and to invest, thereby further feeding into slower economic growth and job creation.